Home Health Creation of a less deadly cigarette? 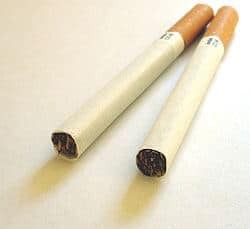 Creation of a less deadly cigarette? From a health care perspective, the best cigarette is no cigarette, but for the millions of people who try to quit smoking every year, researchers from Cornell University may have found a way to make cigarette smoking less toxic. Using natural antioxidant extracts in cigarette filters, the researchers were able to demonstrate that lycopene and grape seed extract drastically reduced the amount of cancer-causing free radicals passing through the filter. The research will be the 1500th article published in the ground-breaking Journal of Visualized Experiments (JoVE), the only peer-reviewed, PubMed indexed video-journal. Scientists have tried to make safer cigarettes in the past. Haemoglobin (which transports oxygen in red blood cells) and activated carbon have been shown to reduce free-radicals in cancer smoke by up to 90 percent, but because of the cost, the combination has not been successfully introduced to the market. JoVE Content Director, Dr. Aaron Kolski-Andreaco, is very excited to be publishing this article as the journal’s landmark 1500th article. To watch the full video article, please click here: http://www.jove.com/video/3406/a-protocol-for-detecting-and-scavenging-gas-phase-free-radicals-in-mainstream-cigarette-smoke.. I believe this is a typo, and should be cigarette instead of cancer. Funny for a typo though.